Note: This recipe follows the basic 1-hour roasting technique for my basic roast chicken recipe. 1. Rinse the chicken, removing & discarding giblets, head & feet (if any, or save to make chicken stock if you are so inclined 🙂 ). Pat dry with paper towels and place breast-side up in the middle of a tray large enough to have about 2 to 3 inches of space from around the chicken to the edges of the tray. 2. Season the chicken and its cavity with 1/2 teaspoon salt & 1/2 teaspoon ground white pepper. 3. In a small bowl, mix the marinade ingredients together and brush/spread a third of the marinade all over the chicken and into its cavity. Insert the quartered onions into the chicken cavity. Reserve the remaining marinade for the vegetables to be oven-sautéed and to baste the chicken with later. 4. In a bowl, add the sliced bell peppers/capsicums, thickly-sliced mushrooms, sliced onions and 2 cloves of minced garlic, pour a third of the marinade over and with your hands, gently toss the vegetables to evenly coat them with the marinade. 5. Pour the marinated vegetables evenly around the chicken. If there are not enough vegetables to cover all the space around the chicken, move the vegetables so that they touch the chicken all around (which may thus leave areas near the edge of the tray bare). 6. Place the tray in the 355°F (180°C) preheated oven, legs in first if possible, and roast for 20 minutes. 7. Remove the tray from the oven and evenly add the vegetables to be roasted on the sautéed vegetables around the chicken, and then toss them around with the sautéed vegetables to coat the newly added vegetables with the chicken & vegetable juices in the tray. 8. Use the remaining marinade to baste the chicken (you can brush the marinade on, or simply spoon the marinade over the chicken and spread the marinade around with the spoon). 9. Return the tray into the oven and continue roasting for an additional 40 minutes (or until a meat thermometer inserted into the thigh reads 180°F or 82°C). 10. 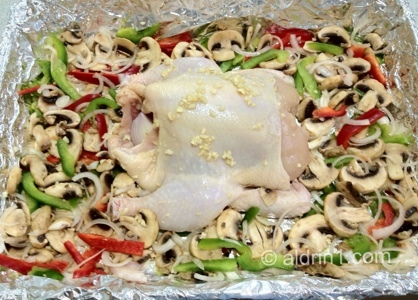 Remove the chicken, remove the quartered onions from within the cavity and reserve the onions. Cover the chicken with a tent foil and let it rest for at least 15 minutes. 11. Place the roasted & sautéed vegetables into another serving plate or two. 12. Pour the remaining chicken & vegetable juices in the tray into a saucepan and add the quartered onions that were removed from the chicken cavity into the saucepan. Add 1/2 cup (~125mL) of water, bring the sauce to a boil and let it simmer for 5 minutes. Season with salt & ground white pepper to taste, strain the sauce and serve it hot with the chicken & vegetables. The resulting chicken was very fragrant and tasty, while the sliced vegetables were truly sautéed and delicious … so delicious that we had quickly gobbled up the chicken & vegetables so fast that I forgot to take a photo for this post :-(. And the sauce was more like a yummy vegetable chicken soup, great for slathering over the chicken & roasted vegetables. Yummy! Let me know how this recipe turns out for you if you do try it, okay? And thanks to you for sharing your family’s thanksgiving recipes.